Excerpt of article originally published under the title "In Middle East, Pence Must Address Realities of Iranian Encroachment." 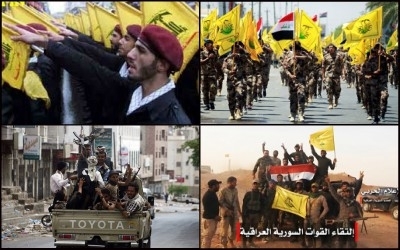 Iranian-backed militia forces are ascendant in (clockwise from top left) Lebanon, Iraq, Syria, and Yemen. The Israeli government is eager to find out details about the Trump administration's forthcoming proposal for reaching the "ultimate agreement" between Israel and the Palestinians. Most Israelis are bewildered by President Trump's optimistic evaluation that an end to the conflict is imminent. The consensus in Israel, including among the Zionist Left, is that the Palestinians are not ready for a historic compromise with the Zionist movement, and their outrage over the declaration on Jerusalem is only one more indicator that they cling to unrealistic goals. Moreover, in Jerusalem, there are apprehensions about an American attempt to entice the intransigent Palestinian Authority (PA) into a deal by pushing for more Israeli concessions. Although many Arab leaders pay lip service to the Palestinian cause, the gravest and most pressing issue in the region is Iranian encroachment. The Trump administration seems to share this concern. It is fully aware that the nuclear deal signed by the Obama administration is a charade and does not moderate Iranian behavior. Yet, it is not doing much about it. This is of much greater concern in Israel than the impossible dreams about Israeli-Palestinian reconciliation. The gravest and most pressing issue of concern for Arab leaders in the region is Iranian encroachment. Trump's acquiescence to the Russian-imposed order in Syria strengthens Iran's grip over the newly built Shiite corridor from the Gulf to the Mediterranean. Tehran is not shy about its next goal: to evict the Americans from the Gulf. Yet, by trying to mediate between Saudi Arabia and Qatar, the United States undermines Saudi efforts to convince Qatar to stop flirting with Iran, with their end goal being the creation of a Persian zone of influence in the Gulf. ... [Israel and pro-American Arab governments will] try to explain the regional realities and enlist American help in containing Iran. They may be successful in convincing the United States to adopt a more realistic lens when viewing the Middle East, but it is unclear if they are able to overcome the isolationist impulses of the American president and America's weariness from its overseas adventures. The "natives" in the Middle East have for several years now seen its retreat from the region. In many respects, Trump continues the ill-advised policies of Barack Obama that reflect a reluctance to stay involved in a very problematic region, particularly since the United States is much less dependent upon Mideast oil. The futile military interventions to bring democracy to Iraq and Afghanistan, which ignored religious and cultural dimensions of the Arab and Muslim world, have fueled the isolationist approach. That said, discrepancies between perceptions over the results of American efforts in these countries and Trump's rosy view of what can be achieved on the Palestinian track, is intriguing. Only deterrence and the occasional use of force can minimize risks to U.S. national security. Of course, the United States has every right to decide where to invest diplomatic efforts and what parts of the globe should be left to their own devices. However, to still be considered a global power and to maintain its own safety, it must retreat in a way that retains American deterrence. Vacated regions easily can turn into staging areas for attacks on the United States. Only deterrence and the occasional use of force can minimize risks to its national security. In the Middle East, the use of force is part and parcel of the rules of game. If the United States wants to disengage from the Middle East it should do so with a bang. The address for such a forceful demonstration is clear: the Iranian nuclear program. A brief air campaign against the key elements of this program, not beyond the capabilities of the U.S. military, would instill fear among America's enemies, reverse Iranian advances and delay the dangers of nuclear proliferation. Finally, it would allow for an honorable American retreat.